The IMF loan is very much on track and the Government will get it within a few weeks, Governor, Central Bank Ajith Nivard Cabraal told Daily News Business. He said that there is no truth in some rumours going around that the US is trying to block this loan and it is a matter of time but it will not take months. The Government having explained to the IMF as to how the intensification of global financial crises in September 2008 have adversely impacted the favourable trends in several economic indicators, relating to the external sector sought a loan of approximately USD 1,900 million recently. 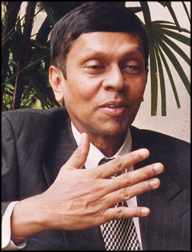 The IMF has been informed that as a result of the war against terror in Sri Lanka coming to an end shortly, there is an immediate need for a large quantum of external financing to continue with the resettlement, rehabilitation and reconstruction work in the Northern Province, and the continued rapid development of the Eastern Province. This is essential expenditure, to uplift the living standards of the people in the areas affected by the conflict and to successfully implement the Government’s efforts to bring a sustainable solution to the problem. Cabraal said that the USD 500 million loan applied from the Government of Libya is on a fast track and it will be available within another two weeks. He said that peace and socio-political stability that would be achieved as a consequence of such initiatives would almost certainly, yield enormous economic and social benefits by way of rapid expansion of the domestic economy. He said that the availability of an IMF facility for balance of payments support at this time, would help to supplement the Government’s efforts to stabilize the external sector performance of the country, and enable the country to face the times ahead with greater confidence and certainty. Such funds would be used to finance the new needs as well as to bridge any gap that may arise due to the global financial crises. It is also expected that such support would enhance the assistance from other development partners as well as significantly improve international investors’ confidence on Sri Lanka.